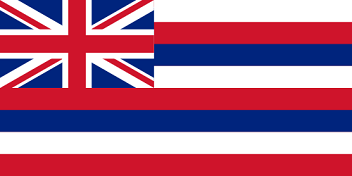 The State Flag of Hawaii features a combination of the designs of two of the most influential countries in the world: the United States of America and the United Kingdom. It serves as a symbol of honor, heritage and regional pride and is displayed at state buildings. There is a strict Order of Precedence for flags. State Flags are displayed in order as they entered the Union. Car Flags are often displayed to represent of an individual's allegiance to their state. Hawaii State car flags are used by their owners as mobile emblems of their home. Car flags are usually made from strong materials and are attached to a car via a pole and clip window attachment. What is the design of the Hawaii state flag? The design is a canton style that combines elements of the flags of the United States of America and the United Kingdom. The ratio is 1:2 meaning it is 1 unit tall for every 2 units wide. Who designed the Hawaii State Flag? What is the history of the Hawaii State Flag? In 1810 King Kamehameha I (c. 1758-1819) conquered the Hawaiian Islands and formally established the Kingdom of Hawaii. The hybrid flag was very similar to the flag of the British East India Company which displayed the Union Jack canton but had only red and white stripes. The Hawaii flag is kept and used as required by the code specified in the constitution of the state.